My name is Susan Hatch. I am a lifelong resident of Minnesota. I currently reside in Shakopee with my husband Tim, our three dogs, Magnus, Gabby, and Rolex, and our three cats, Dinger, Zoomer, and Squeekers. I started grooming at the age of 14. I groomed through high school and college and have always loved it. After graduating from The University of Minnesota, I dabbled in a couple other careers but I always felt a strong pull towards the grooming industry. After several more years of working full-time as a groomer, I decided to open my own shop. It is something that I always wanted to do, so with the help of Tim, we decided to give it a shot. Tim quit his job as an ironworker to help with the shop full-time. He takes care of the cleaning and maintenance. He also operates our pickup and delivery service for our clients who request or require it. We are very fortunate to be surrounded by amazing co-workers and clients. They are the ones who truly make this shop successful. Thank you to everyone for your amazing support. I truly love what I do and treat each and every dog or cat as if they were my own. I must say that I consider myself very lucky because I love my job. Each day is fun and different and the time just flies. I have been grooming since 1998 which has allowed me to develop some amazing relationships with my clients and their dogs. It is fun to see them grow up from cute energetic puppies to sweet adults. In early 2014 I decided to try fostering dogs after having lost my own two elderly dogs the previous year. I fostered 4 dogs before failing on my 5th one. I just had to adopt little Batman! So happy he is mine.....he makes me laugh and smile all day long!! Testimonial: I've tried a other local groomers in the past, but they just didn't 'feel' right. And, I could tell my dogs weren't happy. I ended up trying Fancy Paws because it's close to our home. I immediately felt welcomed, the atmosphere was warm and comfortable and I could sense our groomer, Janet, was the calming force my anxious Westies needed. Fancy Paws has now been our grooming home for 2 years and I would never trust any other place to care for my dogs. 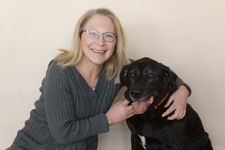 Janet is a master in her field and cares for each four-legged client with patience and love. She goes above and beyond to make sure my girls are comfortable and at ease during their visit. We love Fancy Paws, and now a whole bunch of our friends do too! 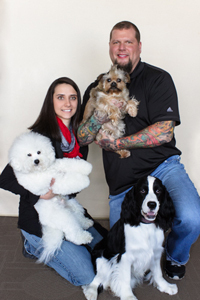 - Kerri H.
II truly feel fortunate to have the opportunity to groom dogs at Fancy Paws. Honestly when I am heading into the salon in the morning, I can't believe this is what I do as my career!! I get to hang out with dogs all day and on top of that I get to make them look pretty. Who could ask for more? Grooming dogs has been my passion ever since graduating from Ruffs Cuffs Professional Grooming School in 1998. I have a loving husband, two beautiful daughters and a Cavalier King Charles Spaniel named Jonsey. I like to spend my spare time with my family doing fun things like fishing, camping and going to Minnesota Twins games. Testimonial: We have found the best dog salon in our area! Being a very over the top "dog mom" I want only the best for my companion. KoKo Bear loves Fancy Paws and her personal groomer, Jodi. We frequent the salon often, due to some allergies, and find the expert grooming by Jodi and the hydro-baths help her to be more comfortable. Fancy Paws and our groomer Jodi provide the best grooming experience. - Linda D.
I have been grooming since 1990 and have enjoyed it every day! I have the patience to groom from a wiggly puppy's first groom to an elderly dog that needs extra tender loving care. I take my job very seriously and want to see both client and dog happy when leaving Fancy Paws! In my spare time, I enjoy spending time with my 10 yr. old black lab named Reggie and playing with Bristol, my 4 yr old cat. Then, in the rest of my spare time, I make the tulle bows that either go on collars or ears for the finishing touch of your dog's groom! I guess you could say my life is filled with animals and my creativity for grooming and making bows for my 4-legged friends! Testimonial: We have been taking our two Goldendoodles to Brenda for nearly 4years. Her warmth and love for dogs was evident from our first visit. Brenda listens to what we want but also isn't afraid to make suggestions if needed. She goes above and beyond what we expect in a groomer and our dogs always come home looking adorable. We would (and often have) recommended Brenda to anyone looking for groomer. But most important, Amos and Annabel love her! Thanks Brenda! - Beth B. In 2005, I was craving a career change. I wanted to use my love of dogs to develop a career in pet grooming. I have really enjoyed working in this industry. I am continually learning and trying new things. Working with the team at fancy paws has given me a great amount of satisfaction in my career. Outside of work, my husband and I enjoy fishing, camping and boating with our sassy terrier, Angel. Testimonial: My Westie is very special! And it takes a special skill to properly groom a Westie. Christine was Bogart's first groomer. She keeps him looking his best! - Jean C.
© Fancy Paws Pet Salon.